There are a handful of nice surfing beaches in Aguadilla, Puerto Rico, as the coastline continues here on the northwest point of the island. They are all worth noting; some more popular and picturesque than others. 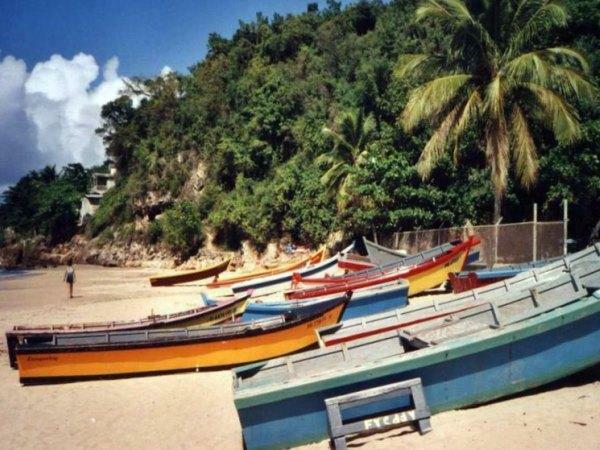 The most well-known beach is Crash Boat Beach. This is probably the most photographed beach in Aguadilla as well. Just a couple miles from Highway 2, Crash Boat Beach sits in all its glory. There are numerous food vendors packing the parking lot with those yummy kabobs that they grill at site. We found everything from popcorn to smoothies here and a small restaurant that serves local fish – since they’re next to the fishing cooperative. But next to the picturesque boats on the sand is an strange and ugly concrete pier. It was a bad design idea because the concrete causes the pier boat slips to fill with sand, making them unusable. Nonetheless, people still flock here, mainly because the sand is great and the beach overall beautiful as the terrain slopes gently down to the shore. Crash Boat Beach is actually two beaches in one. The south side of the beach offers a wide area of sheltered swimming. Then the north side is a tad rougher, with great places to snorkel just around the north end rocks. Watch out for the kayakers here. As with most beaches, tourists make the best of it during the week and the locals come during the weekends. Make sure you plan accordingly, as Crash Boat Beach can get crowded. Surf’s Up at Shacks Beach – some say the Best Surf Beach in Isabela!